100,000 innovations and ideas out there – With more than 5,000 resorts, the number of good new ideas likely exceeds the 100,000 mark. We aim to look at all new ideas and present the best of them to you, our readers. From mega trends to “simply good ideas” – The report not only captures mega trends relevant for ski areas/resorts (e.g., sharing economy) and new ideas based on the well-known ski/travel trends (e.g., freeriding, tocal touch) but also presents ideas that are “simply good”. Easy to implement until the next winter season – This report is NOT a “philosophical paper”; instead, it is a practical guide to innovations and new ideas we have seen successfully put into practice in resorts. We offer well-structured and clear explanations, and our focus is on giving ski areas/resorts the information needed to quickly implement nearly all ideas presented in time for the next winter season. We quantify the relevance of each innovation – In all the talk about trends and innovation, what is most important is how relevant and “hot” the trend/innovation really is. This report provides such a quantified assessments of each trend/innovation based on the opinion of readers, our expert panel, and trendscouts. Share economy goes skiing – Trend #2 – The share economy is probably THE digital trend and buzzword of the past year. We show which concrete effect it can have on ski areas/resorts and which ski innovations/ideas build on this global mega trend – more information. Ski BunJRide – Bungee jumping on skis – Trend #65 – The Ski BunJRide combines ski jumping, bungee jumping, and zip lining and opened in Tignes in December 2014 – more information. 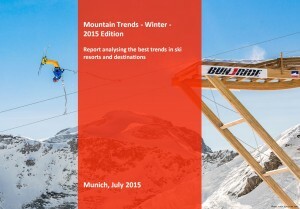 Noticed a trend, innovation, … – If YOU noticed a mountain trend (winter or summer), let us know – New Trend Idea.